Some weeks are what I call ‘lottery’ weeks. This is one such week. Coming off the Pahlmeyer dinner Monday and Mike Hirby last evening, I can’t help but think how much of a lottery winner my group and myself really are. Mikes wines have a sensibility and focus that I have not found in too many other labels. Since his days at Rockledge and Realm I have been a fan and while he has mad skills with my favorite grape, I believe is his real strengths are in his Rhône’s, whites and Pinot. I know he is a passionate about everything he does, but with an early background as a sommelier, his love for the full spectrum 'must be' and 'is' obvious. I like that his Chardonnay has booted the superfluous varieties and become purer and closer to its Burgundian roots. His Petite Sirah is deftly made and is not ponderous and his Pinots are focused and pure. His respect for ‘site’ is second to none. It is for these reasons that coming behind Pahlmeyer only emphasized and broadened the contrast of how lucky ‘us’ lovers of California wine truly are. There are so many great wines and fantastic vintages in our front yard at this moment in time that we don’t know where to turn first. These wines tonight are a good start. As usual the staff at North Square did a great job although I sent my steak back; this is the first time in about 35 dinners something went back. It was too well when medium was requested. Problem rectified quickly. We started with an interesting broad ranged flight of Chardonnay, Pinot Noir and a Red Rhone Blend. 2011 Relic The Sage Chardonnay- this was pretty and focused with wonderful notes of fresh cut lemon grass, pain grille with a deft use of oak. Wonderful texture and liltiness that is refreshing. Count me as a fan. 2011 Relic Wines Pinot Noir Kashaya- Initially this was tight and slightly unyielding. Within 10 minutes it seemed to come alive and just explode from the glass. The nose showing pretty spring flowers and pure red raspberry notes. Its presence was lofty and lilty all at one as balance was spot on. I got tiny notes of earth and spices. A conveyor belt of all things great in Sonoma Coast Pinot. Love it to death. 2011 Relic Ritual Red (Rhone Blend) - An interesting wine with some dark red fruits of raspberry and black cherry. Some nice notes of olive tapenade, rosemary and river stones really added to the dimension of this rich and focused wine. Initially showed a slight dry note in the mid-palate but that went away fast and cohesiveness took control. This had a great finish. One to watch. 2010 Palm Terrace Cabernet Sauvignon- The second wine of Husic, this showed some sweet and sour fruits up front. There were hints of vanilla and cedar. A red/black fruited wine that seems slightly unfocused at the moment. When I tasted the Husic, I got ‘it’. 2010 Husic Cabernet Sauvignon- Black fruited profile with a stroke of elegance and finesse. Deep and layered, this was a more complete and enjoyable Cabernet. I love richness and this was rich. Somewhat masculine with complicated tannins. The finish went on and the black cassis, currant and black plum remained in play. Fantastic. 2010 Sarocka Red Wine- A new acquisition (client) for Mike. This was started by Helen Keplinger. Black fruits of currant with cola, graphite and fresh rubbed leather. I got a sense that Mike might choose a different oak going forward as this has a wee bit sweet vanillin twang that seemed out of place with Mike Hirby Cabs. This had some elegance and a bit of show with a long finish. 2010 D.R. Stephens Moose Valley Cabernet- Initially a bit subdued and quiet. Its sibling was in control. This had some black currants, hints of cola and a bit of sassafras. The thing is once food arrived it came alive and the tables were turned. It was a totally different wine. Interesting. 2010 D.R. Stephens Walther River Block Cabernet- Mikey (me) likes it; it’s fragrant and pure with a slight middle gobbiness that is endearing. (In a good way that is!). More the wine you want when food is not around. (See above). A well made Cabernet that has some intensity and focus. Very nice. 2010 Relic Wines The Artefact Cabernet Sauvignon- What a fascinating wine. This is intense black cassis, blackberry and plum with crème de cassis interlaced throughout. Wonderful structure houses so much good stuff, I’m in love and found my WOTN. Interesting notes of cardamom and framboise with a small berry mouth feel that grabs your attention and does not let go. Finish is amazing. Wow. This is one I will seek out when it is released. 2010 Relic Wines Petite Sirah Old Vines- Forget everything you ever knew about Petite Sirah. No need for labels aptly named ‘Muscle Man’ etc. This is a new direction petite; deep dark and packed with blue and black fruits but magically it has ZERO heaviness and not a sign of ponderous in sight. It floats across the palate and leaves a coating of fruits in its wake. A true party in your mouth. It’s perfectly balanced; tannins complicated and acidity in check. A deft mid-palate with some nice freshness never numbs the tongue. Impressive. I am a believer. No matter what, I will put these into my cellar as soon as I could. All my friends will be jealous. A big thanks to Mike for sharing these with the lottery winning group named CLONYC. If you have never met Mike, you must make it a point to when you visit the Valley. I don’t think I have met a more humble and passionate wine guy in my life. If you have met him, you know what I mean, so just nod. Last night my little group had the good fortune of hosting a Pahlmeyer Winery dinner with fellow board member Jamie Watson and Ralph Pahlmeyer. A fantastic array of wines were in attendance. We had a mini vertical of 10-12 year old Merlots, a 7 vintage run of the proprietary red, a new wine called Right Bank Blend and the PDR. (Piece de resistance). That last wine is very limited and sells out in 48 hours. I think what I like most about the gatherings is the fun and laughing we all engage in while drinking through these wines and eating some dead animal meat. (My steak was stupendous last night). Jamie and Ralph are two great guys that seemed right at home with this sometimes boisterous crowd, all while adding some great info about each wine we were tasting. The staff at North Square did a wonderful job (as usual). Let me get to the wines, which by the way showed fantastically. I love the consistency these attain year in and out. 2006 Pahlmeyer Chardonnay- I loved this. It had some great aromatics of fresh citrus and flowers. The palate had a creamy texture, hints of toast, frangipani and cut grass. Love this style of Chardonnay and while I can’t say I have had loads of experience, through these dinners I have had an admirable exposure and lets face it, good wine is just that--- good wine. 2001 Pahlmeyer Merlot- the first thing you (me) spots with this is its texture and structure. A Cab drinkers merlot for sure. Some pretty floral notes on the nose and a black fruit profile. It’s elegant and refined. Interesting notes of graphite, black cherry and cassis. Wonderful. 2002 Pahlmeyer Merlot- The nose had some sulphur at first, but that seemed to dissipate within 5-6 minutes. The palate had wonderful cherry with notes of rubbed leather and cardamom. Lovely, save for the nose. 2003 Pahlmeyer Merlot – The redder of the bunch and the most cab like in its approach. Larger boned with notes of sassafras and raspberries. I loved it. 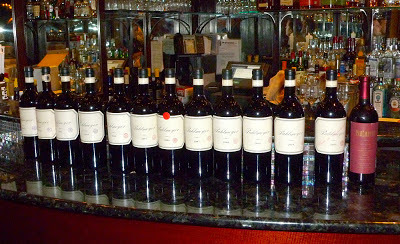 Initially I was going to pick the 2003 as my number one, but when I reviewed them all again, I had to choose the single most complete wine of the group and that was the 2001. Voting for first position went with 6 for the 2001, 4 for the 2002 and 1 for the 2003. 1994 Pahlmeyer Proprietary Red- thanks to Steve for bringing. This had the ‘complexity’ those old world guys love. To me it was too old. The nose had some nice intensity of red/black fruits. I got notes of cardamom, lead pencil, old cedar, earth and red cassis. Acidity was a bit hi-toned and tannins fully resolved. The fruits in the nose did not really carry over to the palate and it seemed like the secondaries and tertiaries were in control. Old wine is just that, old wine and as subjective as the days are long. I get lots of grief from the crowd on this point. Five of them will not be invited back. 2004 Pahlmeyer Proprietary Red - (Cabernet Sauvignon, Merlot, cab Franc, Petit Verdot and Malbec, as they all are) Holy-moly this is good stuff. This expressive wine is off the hook. (Do people still say that?). It’s dark, big boned fragrant and deep with a black fruit profile leading with currants and plum pumice. Interesting hints of cedar-box and coffee bean. Tannins are complicated and still lively and overall balance is near perfect. Wow, this is what I have come to expect with Pahlmeyer. 2005 Pahlmeyer Proprietary Red - Nose as the 2004, this is slightly more brutish and attacking in its approach. The black fruits control this once again. Tannins seemed larger and ‘bulkier’ and the overall package screams for attention. Long finish with all the fruit remaining. Nice job. 2006 Pahlmeyer Proprietary Red - Once again, the similarities are all there, this one just showed the extra year of ‘youth’ in a slight hint if popcorn, but that did not stay to play too long and it became as its older brethren, just an amazing display of consistent black fruits, elegance and strength. I love what these don’t have as well: any rough edges or hints of anything even remotely green. A true winemakers ‘tour de force’ this flight has been. 8 votes for WOTF go to the 2004 with 3 votes for it as no 2. The 2006 garnered 3 votes for WOTF and the 2005 got 1. I went with the 2004. 2007 Pahlmeyer Proprietary Red - This had the Pahlmeyer nose with some added flash and bang. I know 2007s are popular and I am not, but my scientific study always tells me that theory remains. (When I view my glasses in a flight of 3, which one empties first. Science gotta love it). I may have dumped this. (Ducking for cover!). All these 2007s seem to lack structure. This showed some sweetness not evident elsewhere on the table. A well made wine that I might have enjoyed more had it been the lone bottle on that table. (Did I recover ok with that? Hope so). 2008 Pahlmeyer Proprietary Red - I LOVE this vintage. Fragrant and full bodied without being ponderous, this has pure red/black fruits of cassis, blackberries and pomegranate. Lovely texture through the mid-palate and a finish that could sink a ship (if finishes sank ships). This one had the signature ‘richness’, poise and elegance while being quietly powerful and Omni-present. Wow. 2010 Pahlmeyer Proprietary Red - youthful (ya think? ), this seemed to show its stuffing and if a crystal ball sat atop would show similarities to the 2008 and 2005. A bit redder in profile with some oak showing through. You gotta love its potential and breed. This is rich and vibrant and will reward the patient, and when I say patient I mean 5-7 years. 7 votes for the 2008 as WOTF and 5 for the 2007. I went 2008 with the 2010 in my number 2 which had a total of 6 in the number 2 spot. What a great run of reds these last two flights were. 2009 Pahlmeyer Right Bank- I forgot to write the percentages on this but I seem to recall 60% Cab Franc and 40% Merlot (the other way around maybe?). Again, a very distinctive wine that has the Pahlmeyer hallmarks I’ve come to expect: richness and super fragrant, this conveys a sense of what the Pahlmeyers have set out to do with it, go Right Bank like say a Cheval Blanc. After having Bevan’s CFs earlier this year, I can say this one stands up to those. Pretty spring flowers, worn leather with some pain grille, espresso and cola. I also sensed a hint of Bing Cherries and marzipan. A beautiful wine and we were glad to have it on our dinner table, albeit a ‘late in the evening’ dinner table. 2009 Pahlmeyer Proprietary Red - Somewhere between the 2008 and the 2010 you will find the 2009 and I am not speaking just vintage; it had the Pahlmeyer richness with the added youthful slight un-cohesiveness. Slight. Give this 3-4 years (or more) and let it sing its song. It will be a great song. I got some vanilla, black raspberry and framboise. Deep and layered, these really show house style. Fantastic. 2009 Pahlmeyer PDR – (Piece de Resistance) - this is the best 3 or 4 barrels held back in reserve and only in the best of years. Its always 100% Cabernet Sauvignon. This certainly had its own direction; pure and brawny with super-structure and density. Deep and layered, this had some slight grip to its tannins while being nicely balanced. Black currants, blackberries and black plum with notes of new leather, spice and framboise. A fantastic wine that showed its singularity on this night. Just great stuff, if you can a) find it and b) afford it. 9 WOTF votes for the PDR, 2 for the Prop Red and 1 for the Right Bank. The last vote is telling because it comes from my Franco-sensible buddy, Nano. I always say he has one of the broadest palates in my circle. I am actually quite jealous of such. A fantastic night filled with amazing wines, lively conversation, some friendly banter (of which I always seem the target of) and good food. (On this night my steak was spot on. I had to Facebook a picture of it). Thanks to Jamie, Ralph and the whole Pahlmeyer family for supplying such a memorable evening.